Registration for Summerparty on the 2nd of June. On the 2nd of June Italy celebrates its national day: la Festa della Repubblica. 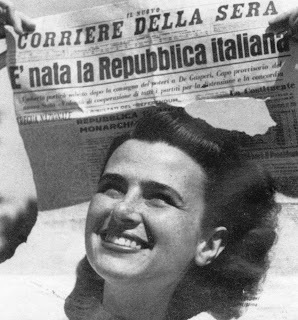 The 2nd of June 1946 general elections were held in Italy. They were the first elections after 20 years of fascists regime and World war II; for the first time, Italian women were allowed to vote in a national election. To celebrate this day, IKIS invites you on Sunday the 2nd of June to an Italian party with grilled food, wine and music. From 3 pm at Bergelands bydelshus, Jelsagata 2, 4012 Stavanger. Please bring your own food to grill. Beverages (wine, beer, soft drinks, coffee and tea) will be sold at a very reasonable price, to help cover the expenses for the event. Please register online or send us an email if you are planning to join us so we have an idea of how many people there will be.